The closest stations to the gîte to take the Yellow Train (electric tourist SNCF train) are Latour-of-Carol-Enveigt (terminus, at 7 km), Ur-les-Escaldes (at 5 km, request stop), Bourg-Madame (7 km). To take the maximum benefit of the landscape, it is not essential to make the totality of the way. One can for instance take the train at Mont-Louis-La-Cabanasse to put down at Villefranche-de-Conflent. These two fortresses cities are to be visited. In summer, the open-air wagons are very popular, but be careful to protect yourself against the wind and freshness of the tunnels. In 1902, the Compagnie du Midi decided to build the railway track of the future 'Yellow Train'. The construction of 63 km of the track will need the completion of 650 works, including 19 tunnels of 56 to 380 meters, 14 viaducts and 4 arch bridges. At that time the steam engines imposed technical and costly constraints in this mountainous landscape. The Highways Inspector Jules Lax proposes electric traction and a narrower way to reduce costs. The state assumes financial responsibility to facilitate electricity production. The 850 V electric power feeds the train by a third rail parallel to the metric track. After a 7 years work, the line Villefranche-Mont-Louis was inaugurated in July 18, 1910. Then in 1927 the train joined at Latour-de-Carol-Enveitg the line coming from the Ariège. Thus was realized the desire of Mazarin who had tried, with the Treaty of the Pyrenees (1659), to make communicate the Ariège valley with those of Capcir and Conflent. Still in operation, the motor home in 1909 is completed from 2005 through modern power railcars. Since 1995, a powered freight wagon, two powered cars and two rail trailers are included in the supplementary inventory of historic monuments. During the trip, the yellow train will take two remarkable works: Séjourné Bridge (arched) enrolled in the supplementary inventory of historic monuments in 1994. It is named after the designer of the line, Paul Séjourné (1851-1939) and the Gisclard Bridge (suspended), which bears the name of the design engineer of the bridge. It is classified as historical monument in 1997. Before construction of the Yellow Train, it took two days of travel by stagecoach to link Cerdanya and Perpignan. It was also necessary that the snow does not hinder the trip. By reducing the journey time to 3 hours, the train made trade possible all seasons. Tourism was oriented to spa resorts during the summer in this early 20th century. It could now turn to winter tourism, like in Switzerland. The Yellow Train was undoubtedly a booster for development for tourism in Cerdanya. 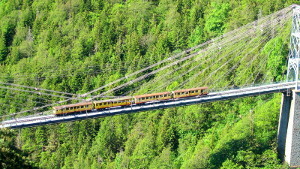 The train is committed to the maximum speed of 35 km / hr on a single track (trains can however cross at Olette, Fontpédrouse, Mont Louis, Odeillo, Saillagouse and Bourg-Madame) to conquer the mountain overlooking the valley halfway up steep slopes. In summer, many tourists climb into the open cars. Along an acrobatic mountainside railway, the electric train offers breathtaking scenery in the heart of Regional Natural Park of the Catalan Pyrenees. It is an adventure awaking all senses along precipices, bridges, tunnels, panoramic views and unspoiled wilderness. At the international station of Latour-de-Carol-Enveitg, the metric railway track of the yellow train joins the SNCF network and the boarder of the Spanish RENFE railways.